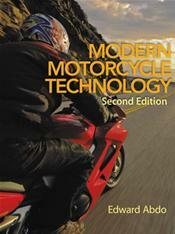 MODERN MOTORCYCLE TECHNOLOGY, Second Edition takes readers on an in-depth exploration of the internal and external workings of today's motorcycles. The book begins with an overview of motorcycle technology, from a history of the vehicle to the current state of the industry. Coverage then progresses to safety measures, engine operation, internal combustion engines (2-stroke and 4-stroke), electrical fundamentals, and overall motorcycle maintenance, as well as a special chapter devoted to troubleshooting. Throughout the book, the author's straightforward writing style and extensive, full-color photos and illustrations help engage readers and bring the material to life. The Second Edition has been thoroughly updated, and includes new content on the latest motorcycle models and technology from today's top manufacturers. The new edition also features additional material on key topics such as fuel injection, suspension systems, and V-engine technology, as well as an expanded suite of separately available supplementary teaching and learning tools--including a hands-on student workbook and electronic instructor's resources. Modern Motorcycle Technology is a valuable resource for anyone seeking the knowledge and skills to succeed in today's motorcycle technology field.